A further modification of the KV-1 heavy tank series developed in the summer of 1942. It passed into Red Army service on August 20, 1942. 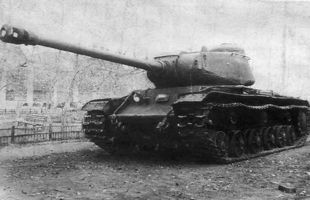 Compared to its predecessors, KV-1S had several design features which allowed for the tank’s weight to be reduced to 42.3 tons. 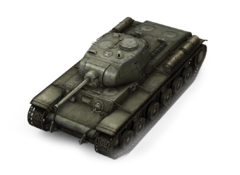 Also, the KV-1S had increased top speed, maneuverability, and durability. However, the 76-mm ZIS-5 gun remained. This, coupled with reduced and inefficient armoring, made the new vehicle basically equal to the Т-34 in terms of battle performance. A total of 1,083 vehicles of this modification were manufactured. This tank was widely used on all fronts of the Great Patriotic War. The KV-1S is a Soviet tier 5 heavy tank. It was considered the most powerful, if not overpowered, tank of its tier, mainly known for its excellent 122mm gun. The tank was nerfed in 2016 with lessened speed and fire rate. An equal of the KV-1 as of July 1017. This tank can be researched from the KV-1 and leads to the IS. 122mm is one of the most powerful guns at tier 6 due to high penetration and alpha. Good agility and among the fastest tier 6 heavies. Surprisingly good gun depression, for a Russian heavy. Very slow reload (About 20 seconds) and poor aim time on 122mm, inaccurate at long range. Unreliable armor except when sidescraping. Although not as well armored as the T-150, the KV-1S trades armor for speed and maneuverability. With top gun, this tank is rightly feared, and very rarely do you see a KV-1S without a 122mm D-2-5T mounted. However, to balance the firepower of the KV-1S, it has been given the lowest hitpoint pool of all of the tier 6 heavies, a painful reload time and a very annoying aim time. In addition the top turret has a sluggish traverse, and despite the decent armor for its tier, it is no match for higher tier guns and can even fail the avid tanker against lower tier weapons. Thus, in some sense, the KV-1S plays in a way that can be seen as slightly comparable to that of the Hellcat. The KV-1S has, like the Hellcat, poor hull armor for its tier and class as well as a poor hitpoint pool (Though the Hellcat's is not the poorest of its tier). Unlike the Hellcat though, the KV-1S also does not enjoy very high agility nor a good aim time and decent rate of fire. The KV-1S is larger, but has much better armor than the Hellcat. The KV-1S is prone to fires which do not help its poor hitpoints pool. Essentially the only major things going for the KV-1S are the 122mm D-2-5T it can equip and its ability to move such a gun in a timely fashion. It can outrun most of its same tier kin and thus enables it to reach positions other tanks would have trouble reaching before the enemy does. The KV-1S can feel like a porcelain cannon, it is not as fragile as the Nashorn, but like the Nashorn, it packs a very nasty punch. With the 122mm D-2-5T, the tank can become decisive in tier 6 matches. As it can one-shot tanks that could prove a threat to lower tier comrades, such as the StuG III G, Hetzer, and Matilda. It can also hammer Tanks such as the KV-1 and Churchill I with relative ease, and finally can shorten the lives of same tier opponents considerably. A penetrating shot from the 122mm can roughly three-shot if not two-shot another KV-1S. This allows the KV-1S to take opponents right off the field, denying the opposing team a set of eyes and a gun, which can prove fatal to a team's chances of victory. At higher tiers, the Penetration of the D-2-5T makes things less easy, as shells will often bounce off most of the tier 7 heavies with even a little frontal armor angling. Firing into a tier 8 Heavy from the front is a bold move in itself as the IS-3 can very easily shrug off the shell. Thus, the KV-1S, combined with its not very good armor, poor reload and bad aim time, makes spearheading with this tank virtually a suicide run. Yet this tank will very highly reward players who make effective and efficient use of the "Peek-a-boom" tactic. Popping out from behind buildings or rocks, taking as much time as possible to aim at a target, fire, and then diving back into said cover. Camping a medium distance from the front lines and keeping up with the front is also a good option for this tank, as its accuracy makes long distance sniping a poor proposition, but not impossible. The KV-1S is even more potent in this situation if it is disregarded, higher tier tanks that do not see you as a serious threat to their health with think twice the second time around as you manage to land punishing blow after blow into their sides or weak spots while they are distracted. Ambushes from behind can also leave victims of the KV-1S as smoldering wrecks. The major goal of the KV-1S is to severely damage as many hostile tanks as possible, secondly as many kills as possible. The more hostiles you eliminate, the fewer you will have to face if your team fails to "Seal the Deal". As the last standing tank on your team, NEVER walk out in the open, especially if heavily damaged yourself. Stay near the base and wipe out tanks as soon as you see them. Face Hugging an opponent can potentially lead to a lucky bounce that can cost the enemy team any hope of victory if it is down to one on one. It is highly advisable to make your way to the 122mm D-2-5T as quickly as you can, the 85mm D-5T can help considerably with unlocking the 122mm, but in order to equip it you need the upgraded turret and suspension. By 1942, when the Germans were fielding large numbers of long-barrelled 50 mm and 75 mm guns, the KV's armor was no longer invincible. The KV-1's side, top, and turret armor could also be penetrated by the high-velocity MK 101 carried by German ground attack aircraft, such as the Henschel Hs 129, requiring the installation of additional field-expedient appliqué armour. The KV-1's 76.2 mm gun also came in for criticism. While adequate against all German tanks, it was the same gun as carried by smaller, faster, and cheaper T-34 medium tanks. In 1943, it was determined that this gun could not penetrate the frontal armour of the new Tiger, the first German heavy tank, fortuitously captured near Leningrad. The KV-1 was also much more difficult to manufacture and thus more expensive than the T-34. In short, its advantages no longer outweighed its drawbacks. Nonetheless, because of its initial superior performance, the KV-1 was chosen as one of the few tanks to continue being built following the Soviet reorganization of tank production. Due to the new standardization, it shared the similar engine (the KV used a 600 hp V-2K modification of the T-34's V-2 diesel engine) and gun (the KV had a ZiS-5 main gun, while the T-34 had a similar F-34 main gun) as the T-34, was built in large quantities, and received frequent upgrades. When production shifted to the Ural Mountains 'Tankograd' complex, the KV-2 was dropped. While impressive on paper, it had been designed as a slow-moving bunker-buster. It was less useful in highly mobile, fluid warfare that developed in World War II. The turret was so heavy it was difficult to traverse on uneven terrain. Finally, it was expensive to produce. Only about 300 KV-2s were made, all in 1940-41, making it one of the rarer Soviet tanks. In response to criticisms, the lighter KV-1S was released, with thinner armour and a smaller, lower turret in order to reclaim some speed. Importantly, the KV-1S also had a commander's cupola with all-around vision blocks, a first for a Soviet heavy tank. However, the thinning-out of the armor called into question why the tank was being produced at all, when the T-34 could seemingly do everything the KV could do and much more cheaply. The Soviet heavy tank program was close to cancellation in mid-1943. The appearance of the German Panther tank in the summer of 1943 convinced the Red Army to make a serious upgrade of its tank force for the first time since 1941. Soviet tanks needed bigger guns to take on the growing numbers of Panthers and the few Tigers. A stopgap upgrade to the KV series was the short-lived KV-85 or Objekt 239. This was a KV-1S with a new turret designed for the IS-85, mounting the same 85 mm D-5T gun as the SU-85 and early versions of the T-34-85; demand for the gun slowed production of the KV-85 tremendously and only 148 were built before the KV design was replaced. 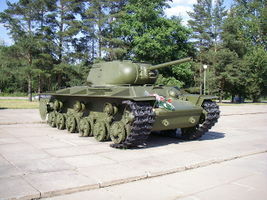 The KV-85 was produced in the autumn and winter of 1943-44; they were sent to the front as of September 1943 and production of the KV-85 was stopped by the spring of 1944 once the IS-2 entered full scale production. This page was last modified on 29 July 2017, at 22:46.